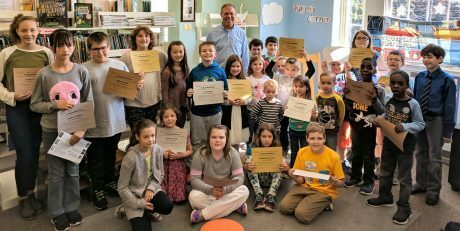 OSWEGO – Assemblyman Will Barclay recently held his Summer Reading Challenge celebration party at the Oswego Public Library. More than 70 kids from the 120th Assembly District participated in the challenge this year and read for at least 15 minutes for 40 days during July and August. About 25 readers attended the party with their family members on Sept. 29. All participants were awarded certificates, a $5 gift card to the River’s End Book Store, and had the opportunity to make a craft, have snacks, and hear a story. Pictured with Assemblyman Barclay seated from left in front are Naomi Locke (Baldwinsville), Naomee Smith (Fulton), Meghan Irwin (Oswego), Madeleine Towner (Mexico), and Wyatt Pratt (Mexico). From left standing are Jordyn Meyers (Fulton), Amithy Fellows (Oswego), Miles Bandla (Oswego), Ajsa Cousevic (Pulaski), Myla Wojtaszek (Central Square), Evan Rood (Oswego), Autumn Delamater (Central Square), Molly Taber (Oswego), Henry Jerred (Fulton), Philip White (Central Square), Jakob Proulx (Baldwinsville), Caden Victory (Oswego), Emma Rainbow (Mexico), Noah Iorio (Fulton), Morgan Pratt (Mexico), Mikayla Towner (Mexico), David Dada (Brewerton), Everett Eastman (Henderson), Benjamin Dada (Brewerton), and Roland “Joey” Stewart (Mexico).